Evil Insects and Bad Bugs! Can You Afford Not To Garden? A Great Book For Plant Propagation! The Greenhouse: What To Do Next? It's been several days since I've been able to accomplish anything on the greenhouse. I'm hoping that Monday will be the day to get things done as it's predicted to be 60 degrees with only a 20% chance of rain. Usually the 20% chance of rain will happen right when I don't want it so I'll be keeping my fingers crossed. Under the picture you will see a short list of what I want to get accomplished on Monday. Finish enclosing the eaves with plywood and trim. Trim the front and back. Remove the screws from the rusted lock mention in my last post. Wow, Dave!!! I'm so impressed with what you've already done!!! I just love your greenhouse. Wish we had built something like that instead of our kit-GH. Yours is so cozy and original, it beckons you to get closer and once finished, you'll probably never want to leave. I know you are super-excited to finish it up! If I get this built like I intend in the end I may have to be dragged away from it! Welcome toThe Home Garden In the Greenhouse Pagewhere I am highlighting the construction of our greenhouse garden shed. 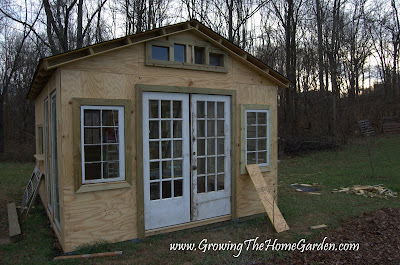 I began building the garden shed in September of 2009 and it is still a work in progress. Please feel free to comment on the posts oremail mewith suggestions or questions! Don't forget to subscribe to The Home Garden! For more About The Home Garden look here! You can alsofollow me on twitter! All content on The Home Garden (www.growingthehomegarden.com) is my original work; all rights are reserved.